Adding off road rims to your vehicle is a great way to bring style and durability to your ride. The reason for this is due to their construction, which is designed to hold up against the toughest terrain while providing smooth handling for drivers. Along with rims for trucks, there are many tires that you can buy that compliment the look and feel of the rims while providing you excellent handling in rough conditions. When looking for the best rim and tire packages here are some tips. First, you will want to select the type that goes best with your ride. As there are many sizes for off road rims designed for different vehicles it’s important you search for parts based on your truck or SUV’s model year and type as this will ensure you pick out the parts most suitable for your ride. One of the best brands of off road rims to get is Ballistic. These are great in that they come in a sharp chrome and black finish with red accents to give the rims a sharp look. These are available in a variety of sizes ranging from 17-20 inch so they can accommodate different types of vehicles. Best of all, the durable construction ensures drivers receive the best performance when going over rough terrain. A great brand for truck owners is Fuel. 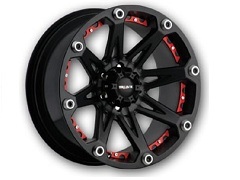 Their off road rims come in a smooth black finish that will provide a solid look for your ride. Further, these are versatile as they are available in any bolt pattern. For its versatility, dependability and style, this is a great brand to buy. For hot rod enthusiast, muscle car rims are a great way to create a timeless look for your ride. The Graphite Bravado Americana II fits this mold well due to its classic styling. The finish is done in matte graphite giving the rims an aggressive appearance that will draw looks anywhere you go. These are the perfect compliment for the 2005-2013 Mustang models. Ultimately, these three brands exemplify the best in innovation and design features. For all they offer these are the perfect additions for drivers looking to kick up their vehicle’s appearance a notch.